For decades the Argus name was probably as well known to the average person in the United States as Nikon is today. And of course, Kodak has long been a brand name of immediate recognition. 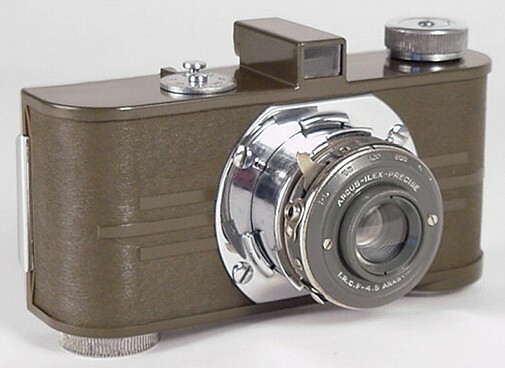 Although the Argus company did not ascend to the heights of Eastman Kodak, millions of Argus cameras have been sold since the first Argus camera, the model A, was introduced in May, 1936. The manufacturer of Argus cameras started business as a maker of radios. Located in Ann Arbor, Michigan USA, the company was known as International Radio Corporation. The company founder, Charles Verschoor, was awarded a patent on August 25, 1936 for a novel, inexpensive but competent 35mm camera design. 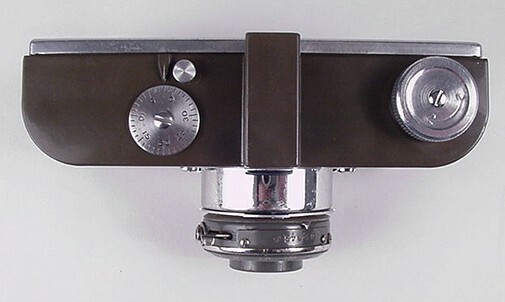 The patent, available for viewing on the Patents page, closely matches the Argus A camera in design. Prior to the launch of the Argus camera, International Radio had gained considerable experience designing bakelite products. Its runaway success, the Kadette radio, was the first bakelite radio to appear on the market. The Argus A camera was sold by International Research Corporation, a division of International Radio Corporation. In 1939 Charles Verschoor sold his radio company to concentrate on his new very successful venture, camera manufacturing. In 1941 the camera company took on the name Argus International Industries, Inc. Over the years the company name was changed a few more times, but since 1941, the company has been commonly known as Argus. Argus Industries Inc. is still in the business of selling cameras. Here is a link to their Web site. At a time when full-frame 35mm cameras were costly extravagances, the Argus A, launched at 12.50 US dollars, was a great deal. According to Argus, 30,000 of these cameras were sold in its first week. In total, over 200,000 Argus A cameras were sold before the model was discontinued in 1941. Of historical note, the Argus A was the first USA-made 35mm camera to use the new Eastman Kodak 35mm cassette. This is the standard cassette still in wide use today. In 1934, two years before the debut of the Argus, Kodak introduced the standard 35mm cassette and the German-made Retina I camera. The Retina I, the first camera designed to use this cassette, was priced at 52.50 US dollars. Although the Retina was less expensive than a Leica, it was still a costly purchase for the average person during the Great Depression years. The Argus A and later Argus models offered features and precision that were suitable for the amateur photographer, at an affordable price. Many students of photography learned, and still learn, the basics of camera adjustments by shooting with Argus cameras. Argus can be credited with accelerating the public's acceptance of the full-frame 35mm format. Another historical achievement of the Argus A camera, is it was the first USA-made full-frame 35mm camera to sell in sufficient quantity to be considered a commercial success. Due to this, the Argus A was influential in the development, acceptance and eventual success of full-frame 35mm photography. As I describe the Argus A in my collection, I'll mention a few of the variations in features that appeared as Argus improved their original design. A source of additional information on these arcane nuances is listed at the end of this page. The body of the Argus A is, as were many Argus models, made of bakelite. This example is olive-drab in color. The other known colors are black, gray, brown and white. The simple optical viewfinder gives a clear view of the subject, and is a vast improvement over the brilliant waist-level type viewfinder common on many roll film cameras of the day. The lens on this Argus A camera is an I.R.C. f4.5 Anastigmat. The iris diaphragm stops down to f11. As was typical of pre-war lenses, the lens in not coated. The shutter is an Argus-Ilex Precise, with settings for 1/25, 1/50, 1/100, 1/200 second, bulb and time. As with other features, Argus A lens and shutter markings varied as the camera matured. The shutter is self-cocking, meaning that one press of the shutter release tensions and then fires the shutter. The camera features a collapsible lens mount, similar in function to that of the Leica A camera. This was done to make the camera more compact when not in use. The lens is not interchangeable. The back of the Argus A is fully removable. To remove, press the side latch, and pull on the leather tab. The back engraving is an attractive touch. 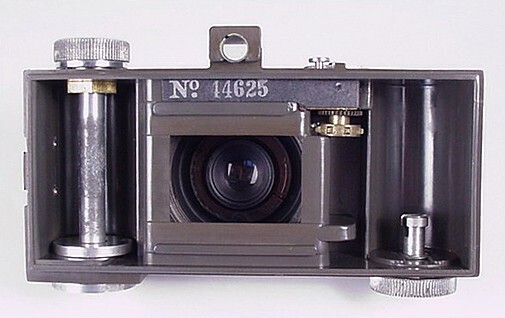 Steel backs were used on very early Argus A cameras. Later, the backs were made of aluminum. This example has an aluminum back. On early Argus A cameras, the film pressure plate was fixed and did not float. On later cameras, the pressure plate floats on a steel spring, as is the case in all modern 35mm cameras. The aluminum back on this example has a fixed pressure plate. Charles Verschoor's 1936 camera patent makes the claim that the camera back was made removable for ease of film loading, and to allow the camera body to be attached to a darkroom enlarger lamphouse. Argus manufactured and sold an enlarger of this type. By using the camera in this manner the owner saved the expense of purchasing a separate enlarging lens. The Argus A film wind knob is located on the top left of the camera. The film rewind knob is on the bottom right. This arrangement is not the norm. A majority of cameras place the wind on the right. However, for a camera with a wind knob, I find placement on the left more comfortable. If the knob is on the right, and it is not geared, then it is necessary to turn the knob counter-clockwise, which I find awkward. With the knob on the left, a right-handed person can simply tilt the camera slightly and twist the knob clockwise. Subtle, but better, in my opinion. Notice that the film sprocket is an unconventional single-sprocket design. A majority of 35mm cameras have sprockets with teeth to engage both the top and bottom film sprocket holes. 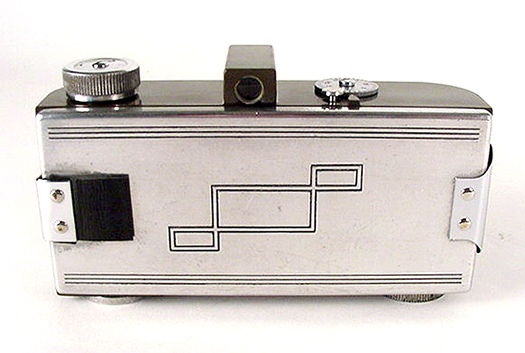 This design appeared only on early Argus A cameras. Subsequent cameras were equipped with dual sprockets. The camera serial number is printed on a strip of black paper, located above the film gate. The Argus A has a manual-reset frame counter. The advance knob automatically stops when film is wound to the next frame. After making an exposure the small round post seen behind the frame-counter wheel needs to be pressed. This releases the wind stop and permits winding to the next frame. The camera does not have double-exposure prevention because the film wind, shutter tensioning and shutter release are not coupled. It is possible to intentionally or unintentionally fire the shutter two or more times before winding the film. Look familiar? This drawing is from Charles Verschoor's 1936 camera patent. 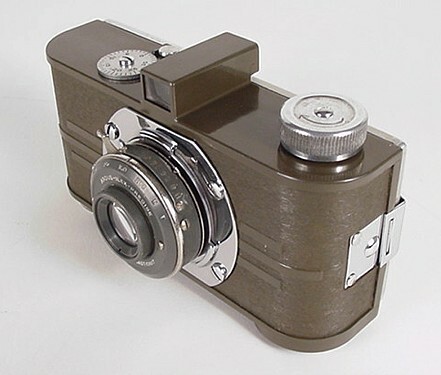 Most of the patent's claims came to life as the production Argus A camera. The full patent and additional design drawings are available on the Patents page. For authoritative information on Argus and its cameras, see the Web site of the Argus Collectors Group. In addition to the site's excellent research material, the Argus Collectors Group hosts an active email forum of Argus collectors and users. Many of its members are seriously and often humorously devoted to anything related to Argus, and photography in general. Their openness in sharing information helped fill the gaps in my knowledge of the Argus company and its products. Members Tom Kraycirik, Phillip Sterritt and Ron Norwood were especially helpful, as were others too numerous to name. If inaccuracies are found on this page - they are my doing, not of those who offered assistance. Additional historical information is available on the Argus Industries Web site, and for information on the Argus company's early history, dating back to its radio roots, I recommend the Web page of Alan Voorhees. You'll find additional information on the Argus A, subsequent models in the A camera line and photographs of a black bakelite model A on James M. Surprenant's Vintage Camera Collection Web Site. Other early and classic American 35mm cameras featured on this site include the Ansco Memo half-frame camera, ca 1926; Perfex Speed Candid, ca 1938; the Clarus MS-35, ca 1946 and the Bell & Howell Foton, ca 1948.